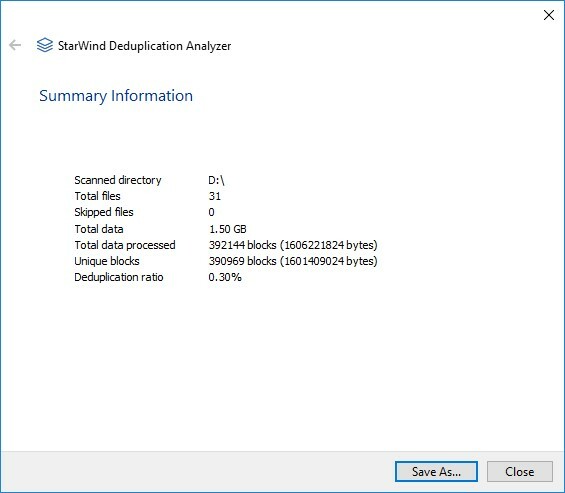 StarWind Deduplication Analyzer is a free software that analyses data on the disk. This tool allows identifying exactly how much a user will benefit from data deduplication in the specified directory. The solution also helps to understand how advantageous deduplication can be if used with StarWind LSFS. 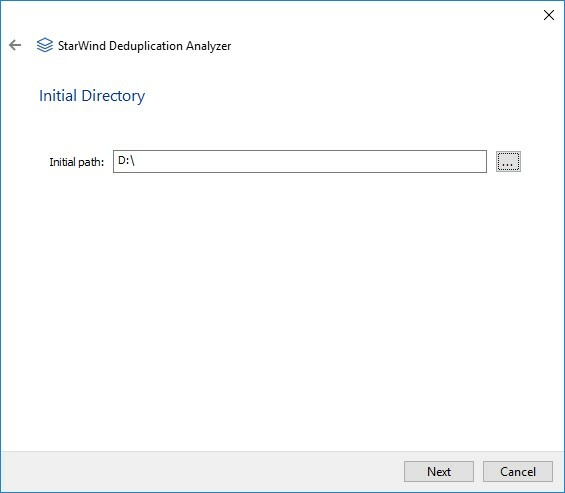 StarWind Deduplication Analyzer requires no installation and runs as a single executable file. 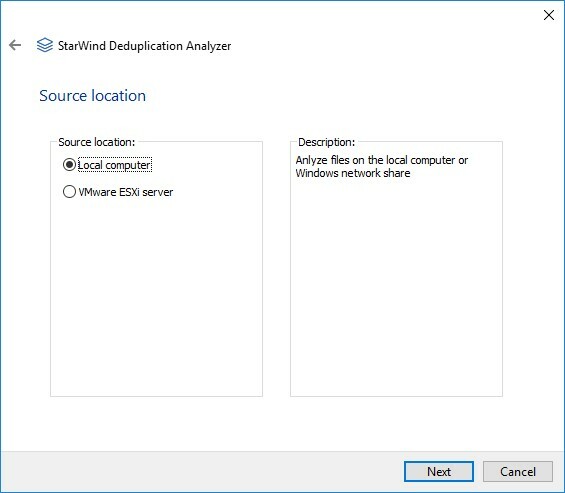 StarWind Deduplication Analyzer has two options: the first one allows analyzing the shared network folders and local folders on a Windows machine, while the second one allows working with ESX Datastore. 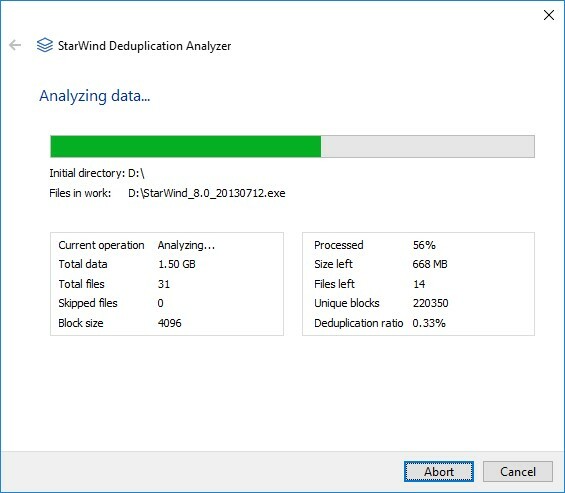 StarWind Deduplication Analyzer works in the following way: the tool runs through the files and shows the deduplication ratio that can be achieved once applied to the user’s files. The program also shows the occupied and free disk space if using StarWind LSFS technology. 1. Launch the StarWind Deduplication Analyzer and click Next. Local computer which allows analyzing the local files or Windows-based shares. VMware ESXi Server with the possibility to analyze the datastore on the ESXi Server. 3. Specify the path to the file storage that will be analyzed. The program runs through all the files of the container specified and processes them with the deduplication module. The software builds a list of all files and analyzes their size. During this process, the wizard displays the scanning progress and the directory/file that is currently analyzed. The program opens the list of files with read-only permission and reads the data sets. The deduplication engine determines if data is redundant and counts the number of unique blocks. The wizard constantly displays the current progress as a percentage ratio of the data processed to the total size of the data files as well as the current deduplication ratio. The information can be saved to your local storage.